The Wabbit and Lapinette waited for Skratch to emerge from the cinema. He was attending a screening of Andy Warhol's 'Empire', and no-one knew when it finished. The Wabbit stuck his paws in his fur and whistled aimlessly. He was between adventures and Lapinette knew he found that frustrating. She stretched out a paw and pushed him a little since he seemed to have gone into a trance. "Penny for them?" she whispered. "Oh, sorry, Lapinette," said the Wabbit. "I was just recalling when I saw that film." "All eight hours and five minutes?" she asked. "Longer," said the Wabbit sadly; "I took sandwiches - which was just as well, because the projectionist ran it at the wrong speed." Lapinette grimaced. "I'd rather see Night Cleaners," "So would I," smiled the Wabbit. "I've got some blank leader film, we could watch that instead." Lapinette laughed and laughed. Then the Wabbit became animated. "Any news from the Department?" "Nothing" said Lapinette. "No sign of an adventure?" asked the Wabbit. "Not a dicky bird," said Lapinette. An unexpected breeze blew through the arcade and ruffled their fur. "The wind of change?" speculated the Wabbit. "Let's throw caution at it," smiled Lapinette. The breeze vanished as quickly it came. Lapinette's radio crackled. 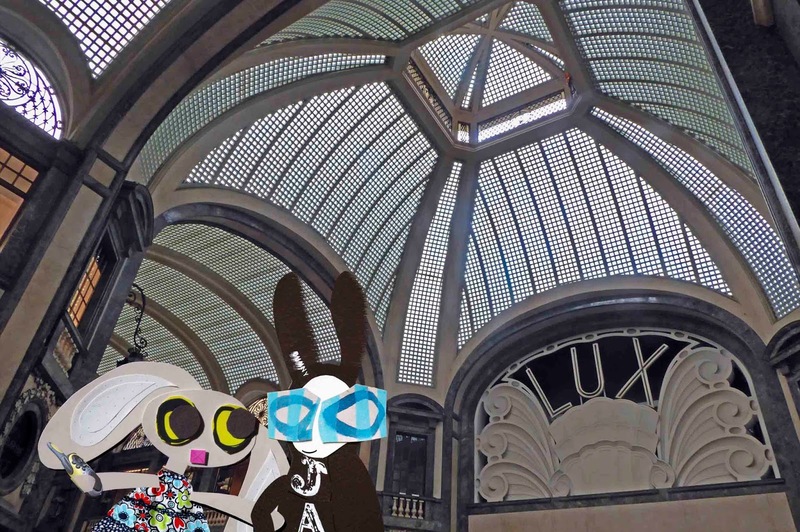 Following a brief interchange, Lapinette turned to the Wabbit "What sort of adventure would you like next?" "Chunky with bright colours," replied the Wabbit.